It’s really starting to feel like summer now. Last weekend, we attended the annual Ballard Seafood Festival. We stayed out late, without jackets, and ate fresh scallops from our favorite stand. We watched a skateboard competition, Festibowl, in the park near our house until the sun started to set. This weekend, we picked fresh lavender and drank farmhouse cider on the Olympic Peninsula to celebrate Sequim’s annual Lavender Festival. A town whose yearly celebration centers around lavender is my kind of town. So much purple. Everywhere! And another sign of summer, my all-time favorite, is that tomatoes have started to appear. Finally! It feels like they took forever to arrive this season. Once we’ve had our fill of the fresh ones, I’ll blanch, peel and freeze the rest to enjoy during the winter months. Or I might stew them (see recipe here) or roast them with fennel and pack them into jars with olive oil for another day. I’m in my element with this stuff. Tomatoes are love. Nick calls me the tomato woman and that is who I will be until the end of the season. 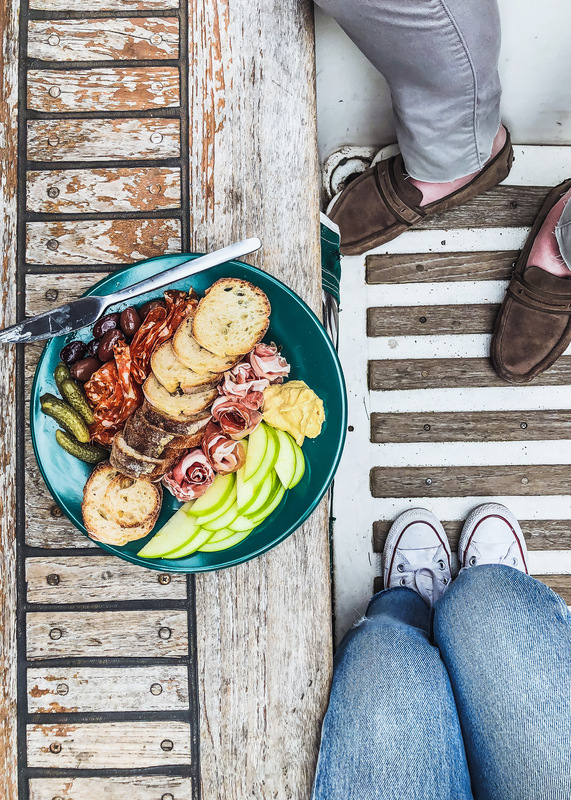 In summer, we eat simple meals and do minimal cooking. We’ve been on a salad kick and I’ve been making dressings and vinaigrettes almost every other day to keep up. (This is an exaggeration, I make about one dressing per week, sometimes two if I’m feeling spicy). The key is to make extra and keep it nearby to drizzle onto sliced cukes or toss with beans to marinate. Just some ideas. One of the staple ingredients for my dressings is Dijon Mustard. It’s a wonderful emulsifier (aka thickener) when blended into sauces and dressings. I used to buy so many bottles of the stuff. I’d always keep different types on hand, like horseradish, stone-ground, beer-braised, you name it. But mustard at the grocery store comes in plastic bottles and so this is something I stopped buying on the reg once we started this zero waste thing. Plus, isn’t it so frustrating when you can’t get the last of the mustard out of the oddly-shaped bottle? Or it’s a squeeze bottle and you have to bang it on the table repeatedly to get a little bit more out. Well, our days of mustard-slamming are done. I make it at home and it’s as good as store bought without the added fuss of plastic or funny-shaped packaging. I keep it in a wide-mouthed jar so that it’s very very easy to get to the last of it. This is one of the only condiments I continue to make at home. I used to make ketchup and BBQ sauce too. But those are time-consuming and turn a ton of tomatoes into a very tiny amount of tomato-based sauce. I’d rather spend my time preserving tomatoes with different recipes (see above). But mustard? Mustard stuck. Probably because it’s so damn easy to make. The hardest part about making mustard at home is waiting for it to be ready to eat! *Brown sugar is optional but I highly recommend it. Start there and customize to your preferences. For example, for this most recent batch, I added some fresh grated horseradish to the mixture. I grated it and blended it in with the rest of the mixture. Look for horseradish root in your produce aisle at the store. It’s delish! Mustard seeds that have been soaking in vinegar and water. So let’s talk about whole mustard seeds for a bit. If you blend them with vinegar and water right away, they will be super bitter. And suuuuper spicy. It’s like eating a large heap of wasabi. That kind of spicy that burns and clears out your sinuses. For most of us, that’s no bueno. 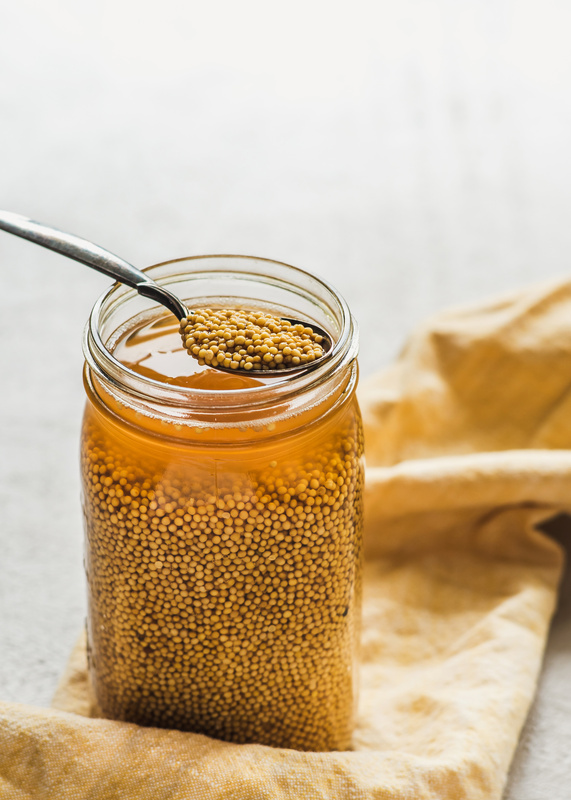 The key to making mustard at home is letting the mustard seeds sit in their vinegar mixture for as long as you can stand it. We are essentially marinating/steeping them in vinegar. So set them aside, on your windowsill or countertop. They will plump up and soften and mild. 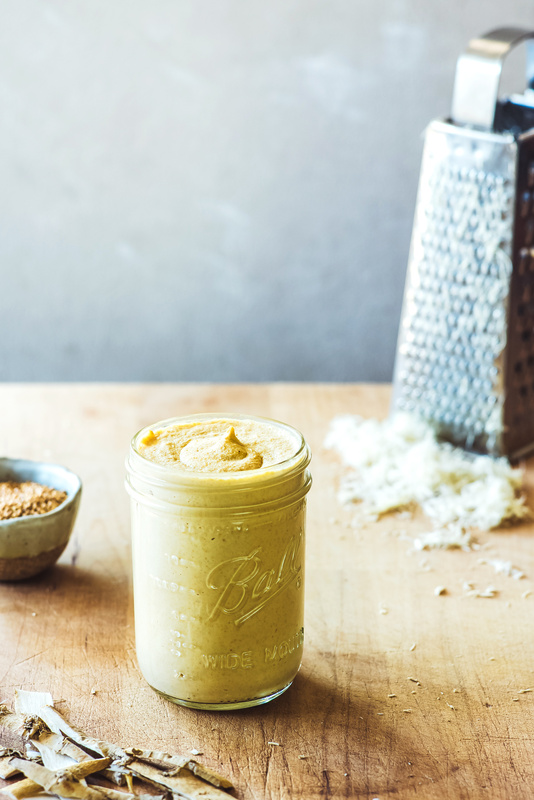 Once you’ve had enough of the waiting game (sometimes I can go three weeks :P), pour the whole mixture into a high-speed blender and away you go to mustard-town. I use my Vitamix for the processing part and it works well enough. I find I can’t really go beyond mid-speed otherwise it won’t work very well. So I just take my time and blend, blend, blend and scrape down the sides and blend some more, until I’ve got it to the consistency I want. I add fresh warm water by the tablespoon if it feels like it’s too dry. And this stuff gets super smooth with a high-speed blender. It’s like store-bought. Only way cooler, because you made it yourself! I originally tried a version of this method from Bea Johnson’s book (she is French, so mustard is a must-have for her). She suggests blending it in the same jar you soaked it in with an immersion blender. Let me tell you, this does not work well enough. Maybe the immersion blender I have isn’t super strong, but when I tried this method, it was a complete fail. I bet a food processor would work great here, too, but I haven’t tried blending it with that. Let me know in the comments if you’ve had success there! Step 1: Add your flavorings (this is fresh grated horseradish). Step 2: Start the blending process. This is what it should look like about halfway through. Step 3: The finished product is smooth and creamy. Y-U-M! Once I’ve got it to where I want it consistency-wise, I spoon it into one or two clean jars. Actually, sometimes I’ll use the same jar it was soaking in. Depends on how much there is to store. This will keep for weeks and months in the fridge. There is enough vinegar in the recipe to keep everything nicely preserved. After time, it may start to separate a bit with more watery juices moving to the top. Just stir it back into the rest of the mixture before using. This time around, I made a larger batch of mustard and froze ⅔ of it. We’ll see how that comes out once I defrost. You can definitely can this to be shelf-stable, but I haven’t tried that myself yet. Would make a really nice gift for the holidays or whenever! I can get all of these ingredients (except for some vinegars) without packaging in the bulk sections of my store. I simply bring my own containers to the store and fill them up there. The mustard seeds, salt and brown sugar can be found in my spice section. You should check your bulk spice section and see what’s there! In the store I frequent, they offer fancy olive oils and balsamic vinegars on tap. Which is fine, but I wish they had less fancy options and more regular staples. Do people actually need five types of finishing olive oil and strawberry-flavored balsamic vinegar in large quantities? I’m not sure. There’s a store in Vancouver called The Soap Dispensary that has white vinegar on tap. There are probably other stores doing this throughout the US. I would definitely frequent that place if I lived in the area! Zero waste is all about choosing the best, most sustainable and eco-friendly option that you have available to you. So I buy the spices in bulk and buy the white vinegar packaged. I used to have dozens of condiments in my fridge. They took up space and some of them I only used once a year. In the last 3-4 years I’ve used most of them up but I have not replaced them. There is a lingering bottle of worcestershire sauce and some fish sauce I use from time to time. The rest? I don’t miss ‘em. Living this lifestyle has encouraged me to live with less stuff, both in and out of the kitchen, and to be honest I’m completely fine with that. I like making do with less, and finding creative solutions to work with what I’ve got in the kitchen. Plus, it’s nice to not have five fancy finishing oils to choose from when I’m about to serve up a salad or a bowl of soup. Just gimme the food already! 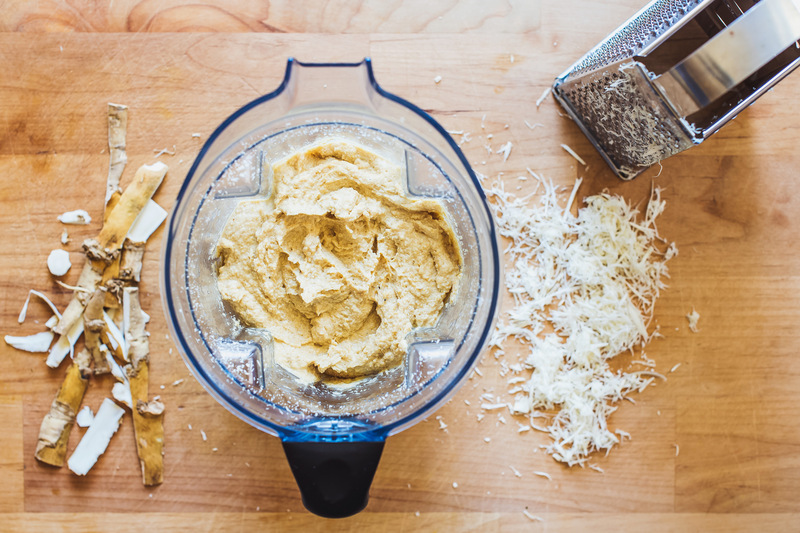 Do you keep a minimalist kitchen or are you condiment-crazy? Let me know in the comments! Place all ingredients in a container with a top that holds at least 2 cups. Stir, cover and let sit for at least 3 days at room temperature. Pour mixture into a high-powered blender or food processor. 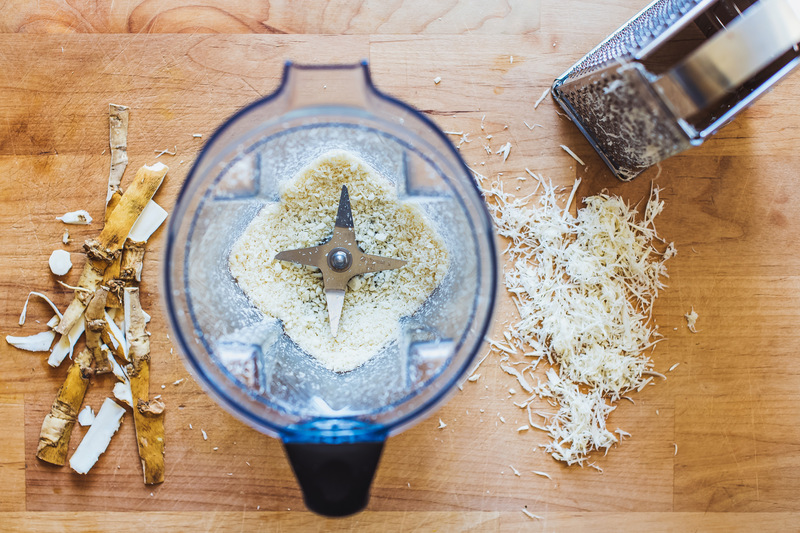 Add additional seasoning or flavors (like grated horseradish). Blend at medium speed until the consistency is nice and creamy, scraping down the sides as you go. Add one tablespoon of warm water at a time during the blending process if mixture seems dry. Careful not to add too much or you’ll end up with mustard soup! 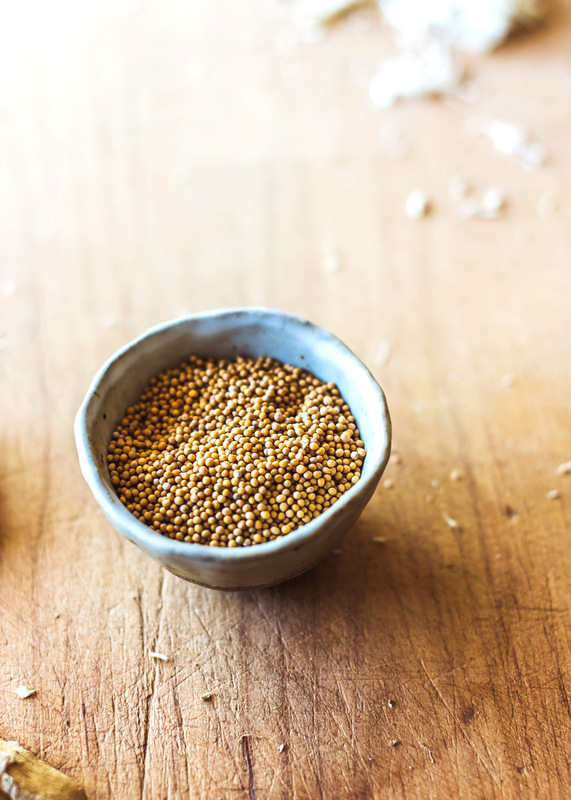 Transfer mustard to a clean, airtight container and store in the fridge. Note: The mustard may taste slightly bitter at first but a couple weeks in the fridge will mellow it nicely.